Poor Fish Returns to Pelton Round Butte, Part 2: Where Do We Go From Here? Earlier this month on the DRA blog, we provided an overview of adult fish return numbers to date for the Pelton Round Butte fish reintroduction program (of which the Selective Water Withdrawal Tower is the centerpiece). Those numbers are pretty disappointing; and likely not just for us, but for everyone involved in the project. At the DRA, we have raised concerns several times—most recently in an October 30 letter to several agencies, which can be read here—about low adult returns. The responses we’ve heard from supporters of the current program primarily fall into two categories. The first is to attribute the poor return numbers to current climate conditions. The second is to argue that the program simply needs more time. Both of these responses are worth examining. The low numbers of returning adult fish are regularly blamed on current climate conditions. Indeed, there is no doubt that climate conditions—and subsequent poor ocean conditions—have created survival challenges for all anadromous fish. However, these conditions are not new. They have plagued salmon and steelhead in the Columbia Basin for at least two decades. However, as far as we can tell these inherent difficulties were not included in the planning or acknowledged uncertainties regarding the Pelton Round Butte fish reintroduction program. And not all years since reintroduction was initiated have been low snowpack or low precipitation years. 2017 was a remarkably high precipitation year with near record-breaking snowpack. 2011 also saw robust precipitation and runoff. In other words, we continue to see annual precipitation variations. With that said, there appears to be little hope for higher average precipitation levels as we move into the future (see Mote, et al, Dramatic Declines in Snowpack in the Western US, Nature: Climate and Atmospheric Science, March 2, 2018, and https://www.opb.org/news/article/snowpack-west-oregon-washington-climate-change/). The long-term trends all indicate that in coming years the Western U.S. will see a continued decline in precipitation, along with reduced snowpack. In other words, these climate conditions are here to stay. In our view, any hope or reliance on increased precipitation or other improved climate conditions for the benefit of the fish reintroduction program appears misguided. Another common refrain we hear from the more ardent supporters of the fish reintroduction program is that more time is needed. They point out that a program like this has never been attempted before, and argue that the system operators simply require more years of research, data collection, and “adaptive management” to get things right. However, we have not seen a clear explanation as to what exactly will happen with more time to make the program more successful. What factor or variable will change over time that will lead to better results? How much better will the results be? Exactly how much more time is needed? What are these predictions based on? We believe it is critical that if this program is to continue, then there must be answers to these fundamental questions. To this point, we have not seen convincing arguments, plans, or data demonstrating that more time will lead to greater reintroduction success. All of this underscores the need for firm goals for the program, on a specified timeline, that the public can access and review in coming years. The costs of this program have been enormous. We have not seen a thorough cost analysis, but we know based on numbers released to the public that the costs for planning, studies, construction, and implementation likely exceed $150 million. And this does not include costs to the lower Deschutes River ecosystem—and the communities that depend on it—resulting from an increased nutrient load being transferred below the Project due to surface water withdrawal at Round Butte Dam. Given all of this, and the fact that trend lines for adult returns are moving in the wrong direction, it only seems reasonable to ask for a critical analysis and review of the current fish reintroduction program. We continue to maintain that an expert panel, external to PGE and the agencies comprising the Project’s “Fish Committee,” should be convened to analyze the current program and assess for modifications that could lead to significantly improved performance. If significant improvements in adult fish returns are not possible, then it is time to consider new fish mitigation alternatives, as contemplated by the Pelton Round Butte Project’s license from the Federal Energy Regulatory Commission. Without significant changes in operation, calls for more time will only delay what ultimately must be done to provide real mitigation. Fish passage at the Pelton Round Butte Project was attempted when the dams were first constructed. A fish ladder was built (at the time, the longest fish ladder in the world) and a gondola at the upper end of the fish ladder lifted adult upstream-migrating fish over Pelton Dam. But juvenile fish couldn’t find their way downstream through Lake Billy Chinook or through Lake Simtustus. When those efforts proved unsuccessful, measures were quickly taken to find alternative methods of mitigation for the lost runs of steelhead, spring Chinook and sockeye. We have requested that the relevant agencies identify potential alternative fish mitigation plans, should the current reintroduction program also prove unsuccessful. We believe it is time to think about the future of fish mitigation at the Pelton Round Butte Project. If it is simply more of the same, we fear the future is bleak for anadromous fish above the dams, and for the health of the lower Deschutes River. The DRA’s important Clean Water Act lawsuit against Portland General Electric is moving to the Federal Ninth Circuit Court of Appeals. This afternoon, DRA notified Oregon’s Federal District Court that we will be appealing that Court’s recent decision in the case. DRA brought this lawsuit in the summer of 2016. We are seeking to enforce requirements—for temperature, pH, and dissolved oxygen—found in the Clean Water Act certification for the Pelton Round Butte Hydroelectric Project. After several notable victories in the case—affirming the authority of citizen groups to bring lawsuits like this one—we suffered our first setback in early August. At that time, the Court ruled against DRA for the first time, finding that PGE was not in fact violating its water quality certification. This ruling came despite an undisputed record demonstrating hundreds of instances where Project discharges exceeded the certification’s numeric water quality standards. We believe it is essential that this fight continue, and are eager to present our case to the Ninth Circuit. Under the Court’s recent decision, PGE is not required to meet numeric water quality standards at Pelton Round Butte, or even to take the certification’s specified actions to come into compliance with those standards. In short, under the Court’s interpretation, the certification does not ensure compliance with Oregon’s water quality standards. We believe this interpretation is contrary to the mandates of the Clean Water Act, and of the Pelton Round Butte water quality certification itself. The failure of the Project to meet these critical water quality standards has coincided with severe ecological changes in the lower Deschutes River. These standards were developed for the express purpose of protecting aquatic life, and we will continue to fight to make sure these standards are enforced. Today marks the next step in our journey to protect and restore the lower Deschutes River. 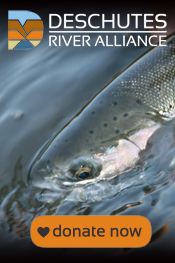 We believe this action is essential for the future of the river we love. Further, the Clean Water Act must remain a powerful, enforceable tool to protect this country’s waters for future generations. As always, this fight would not be possible without your support. Thank you for all you’ve helped us accomplish, and for joining us as we move forward with our efforts.